The following topic describes all visual elements and terms used in a standard RadDataGrid control. ColumnHeader: See how to set the Style of a ColumnHeader. SortingDirectionGlyph: This element displays the sort direction of the column elements if sorting is enabled. When clicked, it toggles between the column sorting options - accending/decsending/none. Filtering UI: Provides UI for applying filters to the grid rows depending on the data in the corresponding column. GroupHeader: See how to change the Style of a GroupHeader. Grouping UI:Provides UI for creating groups of grid items (rows). The items are grouped by the property in the specified column. Items can be grouped by more than one property. Expand/CollapseGroupButton: Expands or collapses the elements in a group. When collapsed, only the group header is displayed. Editing UI: Provides UI for editing the content of the grid cells. 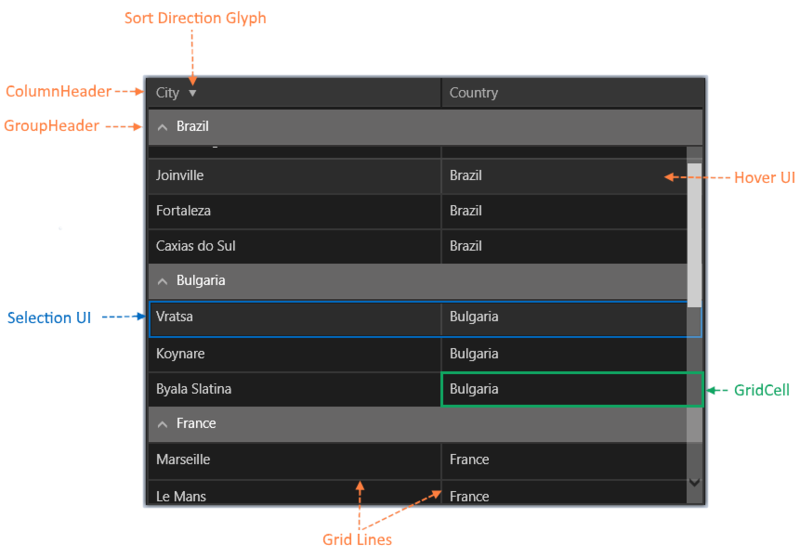 Selection UI: Provides UI for selecting grid items (rows). Hover UI: Provides UI for hovering grid items (rows). GridLine: Represents a single item from the grid ItemsSource. GridCell: Represents a property of a grid item. See how to change the Style of a GridCell content.